Born in the United States of America on October 4 1895, Buster made his stage debut at just 3 years of age. 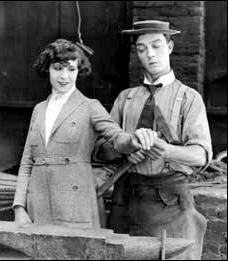 His parents were vaudeville stars and whilst performing on stage his mother would make regular trips backstage to check that young Buster wasn�t getting up to any mischief. everything they were doing. He was a great hit and was immediately made a permanent part of the family troupe. 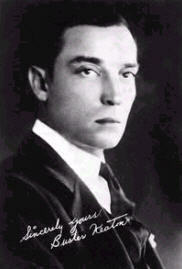 He made his film debut in 1917, when he was asked to play a minor role in a film. Keaton became so fascinated with the possibility of films that he left his high-paying vaudeville head-liner job to take on the lower-paid role of film actor. He was to become one of the most visionary producers and directors of all time, a stunt man who knows no equal and an actor whose soulful, melancholic, indestructibility was only to be rivalled by Chaplin�s heartfelt and inventive tramp.